wrist warmers or fingerless gloves? Maybe we should call them Crochet or Knitting Gloves? and are also, very good to have around. I needed to do. Except the dishes. I was okay with that! 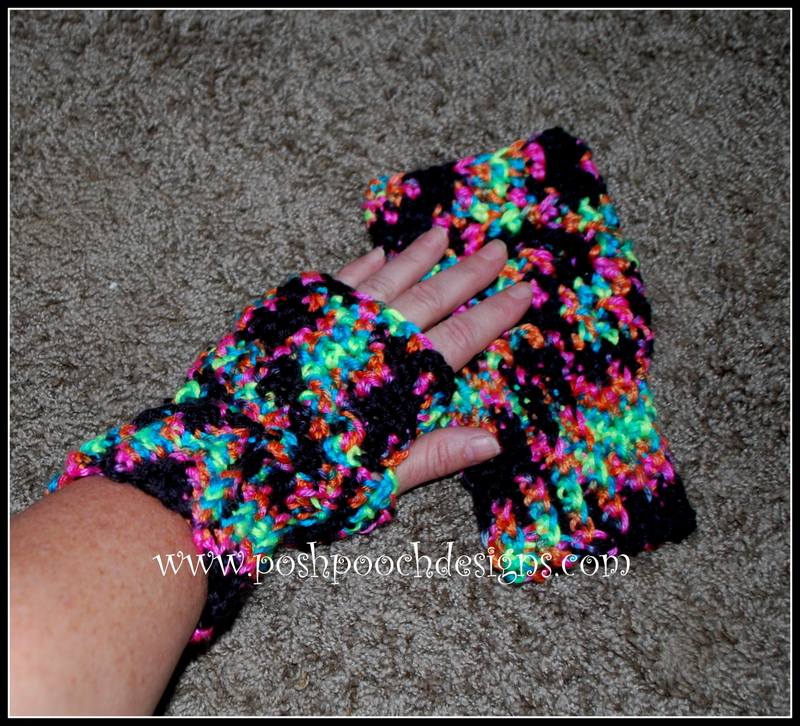 Fingerless Glove Crochet Pattern you will ever crochet. Perfect for Men, Women, Boys and girls! Please, Add This crochet pattern to your Ravelry Favorites. Gloves - Make 2 - These gloves are neither left or right handed, they fit either hand. just add more chs at the beginning ch. Ch 1 at end of rows does not count as a st, it is a turning ch. R: 2 - Blo 1 sc in each sc, ch 1 turn. sc closed, do not cut yarn. R: 36 -1 sc in each dc, join, tie off, weave in your ends. If you want the hand portion longer, just add a row or 2. Repeat for the 2nd Glove. Both are crocheted the same. Labels: easy crochet gloves, Easy Crochet pattern, fingerless glove pattern, Free glove patter, Free glove pattern, Posh Pooch Designs, texting gloves.